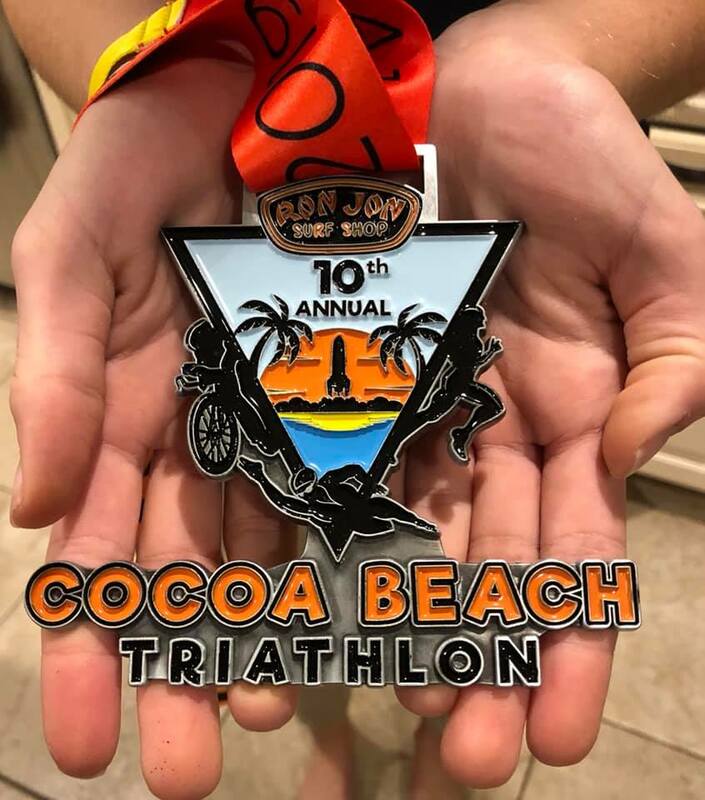 The Ron Jon Cocoa Beach Triathlon is the perfect venue for first time triathletes. The swim is held in the protected waters of the Banana River, and both the bike and run portions are almost completely flat giving athleteas the opportunity to get the greatest benefits from their pre-race training. The race is always held in the spring time, well ahead of the brutal heat of a Florida summer. Race day temperatures are typically in the 65-75 degree range, and the water for the swim is usually in the mid-70s, making it wetsuit legal. *There will be a First Timers and general course overview briefing at packet pick up on Saturday, April 13th at 1pm and 3pm. All are welcome. Want to swim on the Cocoa Beach Tri course before race day? New Wave PT will be hosting a swim course preview at noon on April 13th, the day before the Cocoa Beach Triathlon! Ed Donner, former elite triathlete and local super star who has won this race multiple times will be in the water leading a group! We will have multiple kayaks and paddle boarders in the water to ease open water nerves! Ed & Kaitlin will also be answering all your questions at the swim course preview and at 2pm under the pavilion for a Q&A session! Enjoy yourself – you worked hard for this day. Get to the transition area at least an hour before the race. Lay out all your gear in an arrangement that will make it easy for you to get your equipment – hat, sunglasses, helmet, water bottle belt, etc.. – as you go from the swim to the bike and then from the bike to the run. Practice what you will do in transition ahead of race day. This is the one part of a race where first timers really stand out from experienced triathletes. You can shave minutes off your race time by practicing how you will don equipment and move through the transition. The swim is usually the most nerve-wracking for beginners and even most experienced triathletes. Stay to the outside or in the back. You may likely be kicked and pushed by other athletes so be prepared – it is part of the experience! Relax. Be focused in transition between the various sports. Know where your bike rack is and, again, have your gear in an order that will make it easy for you. Make sure your helmet is on and the strap attached before leaving transition. Do not mount your bike until you are out of the fenced transition area and are told it is okay to do so. Be cognizant of others around you on the bike portion of the race. Always announce “coming up” or “on your left” as you pass other athletes and then get back into the right hand area of the road when it is safe to do so. When going back into transition, dismount your bike when told to do so. DO NOT unsnap and remove your helmet until you are in the transition area. Place your bike back in your rack and in front of your equipment. Enjoy the run and acknowledge that you are about to be a triathlete. Smile at the finish line! Hug your Family and Friends. They put up with a lot for you to achieve your goal! Enjoy the post-race festivities and celebrate your day!